Anti-blister top cover means cooler, drier feet. By controlling the amount the foot slides across the insole's surface, the anti-friction top cover helps prevent blisters and keeps feet cooler and drier. 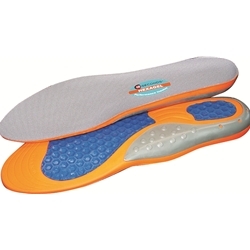 The BioStatic antimicrobial top cover helps keep the insole odor free. Polyurethane insole is a lightweight design that offers cushioning from heel to toe. The unique two-part arch system supports your arch and provides stability. Strategically placed where the foot endures the most impact and pressure as a result of routine activity. Massaging gel design enhances foot comfort. FITTING: Remove the existing insole and slide the new Hexagel Insoles into your shoes. If your new insoles need to be trimmed, use a pen and trace the old insole's shape (forefoot part only) on the bottom side of your new insole. Carefully cut the new Hexagel Insoles with scissors and then place them in your shoes.